Whether you opt for an unplugged wedding or want your guests to get social on your big day, here’s what you need to know! If you’re the master of the dog filter and would love nothing more than a little Snapchat fame on your big day, you can easily create your very own unique wedding day filter. Simply head to Snapchat On-Demand and you can custom-make one for you and your guests to get snap-happy with. If you’d rather not have blurry phone snaps of your wedding being posted online on the day, that’s totally reasonable. Kindly ask guests to respect your wishes and let them know before the wedding that you would prefer no pictures or updates to go online. You can reiterate the information in your order of service or have someone politely announce it before the ceremony starts. If you don’t mind some pictures but want to have some control, a popular option is to ask for no social media updates until the evening reception so your evening guests aren’t seeing any sneak peeks. If you want your wedding to be social media friendly, pick a hashtag for guests to use when sharing their snaps online so that it’s easy to go through all the pictures. Just make sure you communicate what the hashtag is to everyone. Do this by adding the hashtag to your wedding stationery or set up framed prints around your venue. If you’d like to vet any pictures of you from your big day before they make it onto your Facebook page, make sure to change your Facebook privacy settings so you have to authorise any tagged pictures first. No unflattering, half blinking photos of you on your profile, thank you very much! Get your guests really involved in social media and encourage silly selfies with quote signs and wedding-themed props, from cardboard glasses on sticks to mini veils – we love this set from Hobbycraft (£5). Place them on the tables or set up a DIY selfie station for guests to use throughout the day. You can even get personalised cut out Instagram or Facebook frames on sites such as Etsy, just like this one. Yes, someone may post something you would have rather they didn’t, but don’t let it ruin your day. If there’s anything really upsetting you post-wedding, you can always politely ask them to remove it “ but remember they’re just excited to share your big moments! If you want to make your day really social media friendly, did you know that you can live stream video content to platforms such as Facebook and Instagram? It’s the perfect way to share aspects of your day with those wh can’t be there. Just make sure you have a good wifi connection first! Hiring a photobooth? Ask your supplier if they offer the option to upload the snaps straight to social media so your guests can enter their details and share their pictures instantly online. You can find photobooth suppliers in our online entertainment directory here. Shun a digital detox and let these apps help you on your way to your dream day. This app allows you to invite an unlimited number of guests pre-wedding so they can upload all their snaps to the one place, letting you catch up on all the pictures. You can even order prints of your favourite guest pics too. An app for on-the-go, DIY wedding planning, LadyMarry helps you plan a dream wedding with everything from the monthly wedding checklist to hands-on tips. We love the pretty interface too! Did you know you can take SWD with you on your phone or tablet? 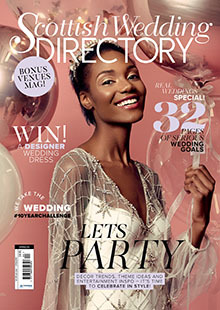 Download our digital edition so you’ve got all our wedding inspo and advice in the palm of your hand. Beauty focus: the £70 Louboutin lipstick that’s actually worth it?